From left to right: Vivian Saridakis (York University), Justin Nodwell, Emil Pai, Oliver Ernst, Peter Lewis, Reinhart Reithmeier, JP Julien. Emil F. Pai is retiring after more than 25 years at the University of Toronto. Emil joined the Departments of Biochemistry and Medical Genetics from the Max-Planck-Institute for Medical Research in Heidelberg in 1991 as a NSERC Industrial Research Chair following a global search for a renowned protein crystallographer to nucleate structural biology at the University of Toronto. Emil was already well-known for determining the first crystal structure of a flavoenzyme, glutathione reductase, as well as those of H-Ras P21 oncogene GTPase and an actin-DNase complex. A Tier 1 CRC since 2002, Emil published over 220 papers now with over 12,000 citations. 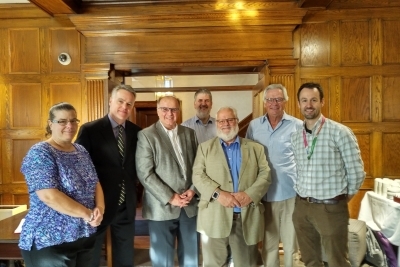 Jean-Philippe Julien (SickKids and U of T) and Vivian Saridakis (York University) organized a symposium on July 18th featuring presentations by former Pai lab members and a Connell Lecture by friend and colleague Greg Petsko (Weill-Cornell Medicine). A retirement event at the Faculty Club the following week featured a string of speakers who highlighted Emil’s stellar scientific career and his role in shaping the careers of trainees. Emil is a hands-off supervisor who lets his students and post-docs develop their own projects. Emil will continue working on some collaborative projects but he is also looking forward to spending more time with his family.